With Jazz Fest in the rearview mirror, New Orleans is slowing down and readying itself for summer’s oppressive heat and humidity. But even during hurricane season, the music doesn’t stop, with all sorts of outdoor concerts, festivals, and parades coming up. We’ve compiled the best of the best of those shows from now until Labor Day’s Southern Decadence, so start marking your calendars. Honey Island Swamp Band The local roots-rock quintet brings sweet tunes like “Chocolate Cake” and “Cane Sugar” to Jazz in the Park. Honey Island Swamp Band Louis Armstrong Park The local roots-rock quintet brings sweet tunes like “Chocolate Cake” and “Cane Sugar” to Jazz in the Park. Bayou Country Superfest Kickoff Party Before the summer country fest begins at the Superdome, get pumped at this free outdoor show featuring up-and-comers Easton Corbin, Dylan Scott, and Eric Paslay. Bayou Country Superfest Kickoff Party Champions Square Before the summer country fest begins at the Superdome, get pumped at this free outdoor show featuring up-and-comers Easton Corbin, Dylan Scott, and Eric Paslay. 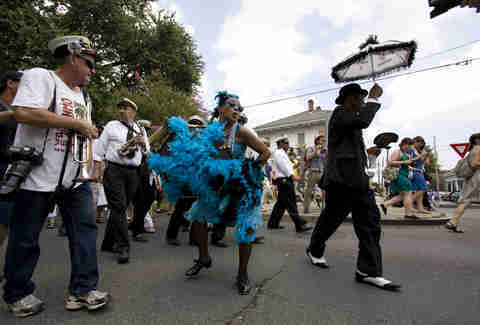 parade-style party that features live jazz, wine tastings, and food tents. Greek Festival Grab yourself an ouzo daiquiri and settle in for some traditional Greek music from The Levendes, Hellenic dance performances, and plenty of food. Admission is free on Sunday if you wear a toga. Greek Festival Holy Trinity Greek Orthodox Cathedral Grab yourself an ouzo daiquiri and settle in for some traditional Greek music from The Levendes, Hellenic dance performances, and plenty of food. Admission is free on Sunday if you wear a toga. Slidell Jazz and Blues Festival This concert benefits local music education and features six acts, with the Big E Brass Band and Astral Project topping the bill. Slidell Jazz and Blues Festival Heritage Park, Slidell This concert benefits local music education and features six acts, with the Big E Brass Band and Astral Project topping the bill. Jon Cleary Singer and pianist Jon Cleary, who’s played with the likes of Ryan Adams and Bonnie Raitt, closes out the Jazz in the Park season with his blend of R&B, soul, and funk. Jon Cleary Louis Armstrong Park Singer and pianist Jon Cleary, who’s played with the likes of Ryan Adams and Bonnie Raitt, closes out the Jazz in the Park season with his blend of R&B, soul, and funk. Oyster Fest As if the shucking and oyster-eating contests weren’t enough entertainment, the festival offers two solid days of tunes from the likes of Luke Winslow-King, Flow Tribe, and, yep, Bonerama. Oyster Fest Woldenberg Park As if the shucking and oyster-eating contests weren’t enough entertainment, the festival offers two solid days of tunes from the likes of Luke Winslow-King, Flow Tribe, and, yep, Bonerama. Muse and Thirty Seconds to Mars The always theatrical English rockers bring their laser-filled show to the Square, with Jared Leto and co. opening. Muse and Thirty Seconds to Mars Champions Square The always theatrical English rockers bring their laser-filled show to the Square, with Jared Leto and co. opening. New Orleans Pride Parade Strut your stuff and celebrate the LGBTQ community with a glorious parade and music from brass bands, DJs, and more. New Orleans Pride Parade French Quarter Strut your stuff and celebrate the LGBTQ community with a glorious parade and music from brass bands, DJs, and more. Creole Tomato Fest Come hungry for the tomato-eating contest and sip the best Bloody Marys on the planet while brass bands and gospel choirs perform in and around the French Market. Creole Tomato Fest French Market Come hungry for the tomato-eating contest and sip the best Bloody Marys on the planet while brass bands and gospel choirs perform in and around the French Market. Third Eye Blind The band comes to Champions Square as part of its 20th anniversary tour. If you lived for their 1997 self-titled debut, this is your chance to see them perform it in its entirety. Third Eye Blind Champions Square The band comes to Champions Square as part of its 20th anniversary tour. If you lived for their 1997 self-titled debut, this is your chance to see them perform it in its entirety. Cajun-Zydeco Festival Come for the new “dessert oasis” area in Congo Square for some sweet treats, stay for impeccable zydeco from the likes of D.L. 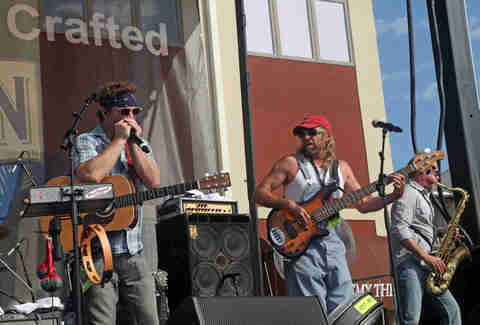 Menard, Chubby Carrier, and the Lost Bayou Ramblers. Cajun-Zydeco Festival Louis Armstrong Park Come for the new “dessert oasis” area in Congo Square for some sweet treats, stay for impeccable zydeco from the likes of D.L. 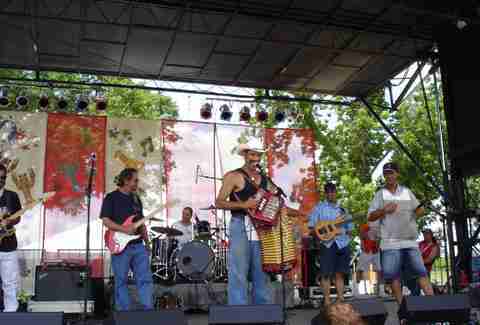 Menard, Chubby Carrier, and the Lost Bayou Ramblers. Warped Tour Head to the home of the Baby Cakes for an afternoon of punk and metal from Sick of It All, the Adolescents, Gwar, Bad Cop/Bad Cop, and dozens more. Warped Tour Shrine on Airline Stadium Head to the home of the Baby Cakes for an afternoon of punk and metal from Sick of It All, the Adolescents, Gwar, Bad Cop/Bad Cop, and dozens more. Third of July Celebration Celebrate Independence Day early with the local Marine Corps Band and a fireworks show on the great lawn. Third of July Celebration City Park Peristyle Celebrate Independence Day early with the local Marine Corps Band and a fireworks show on the great lawn. 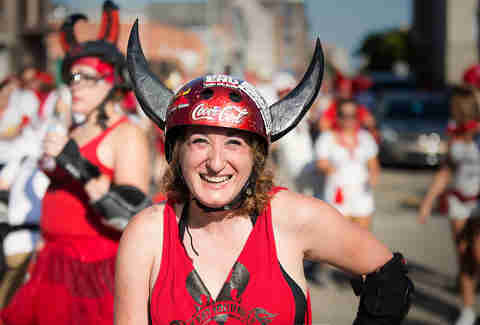 Running of the Bulls Instead of actual bulls, hundreds of roller derby girls armed with plastic bats chase down runners throughout the streets. Whether you got hit or not, head to the Sugar Mill’s afterparty for live music from the Zydepunks and DJ sets. Running of the Bulls Downtown Instead of actual bulls, hundreds of roller derby girls armed with plastic bats chase down runners throughout the streets. Whether you got hit or not, head to the Sugar Mill’s afterparty for live music from the Zydepunks and DJ sets. Bastile Day Fete Celebrate New Orleans’ French heritage at this annual party that includes live music, cooking demonstrations, museum tours, and plenty of food and wine. Bastile Day Fete New Orleans Museum of Art Celebrate New Orleans’ French heritage at this annual party that includes live music, cooking demonstrations, museum tours, and plenty of food and wine. Incubus, Jimmy Eat World Take a trip down memory lane with Incubus and Jimmy Eat World. Even if you only know the old hits, the new stuff sounds pretty great, too. Incubus, Jimmy Eat World Champions Square Take a trip down memory lane with Incubus and Jimmy Eat World. Even if you only know the old hits, the new stuff sounds pretty great, too. 311 They didn’t have their big 311 day blowout in New Orleans this year to make it up the fans. Expect the hits, deep cuts, and covers. 311 Champions Square They didn’t have their big 311 day blowout in New Orleans this year to make it up the fans. Expect the hits, deep cuts, and covers. Satchmo Summerfest Celebrate Louis Armstrong’s 118th birthday with tunes from traditional jazz outfits and brass bands. Past headliners include Preservation Hall Brass Band, Kermit Ruffins, and Charmaine Neville, so expect that level of quality again this year. Satchmo Summerfest French Quarter Celebrate Louis Armstrong’s 118th birthday with tunes from traditional jazz outfits and brass bands. 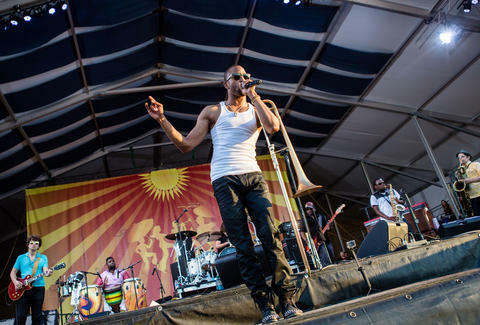 Past headliners include Preservation Hall Brass Band, Kermit Ruffins, and Charmaine Neville, so expect that level of quality again this year. Dirty Linen Night Peruse Royal Street’s art galleries and shops while enjoying live music from local street musicians, and take advantage of the food and drink specials. Dirty Linen Night Royal Street Peruse Royal Street’s art galleries and shops while enjoying live music from local street musicians, and take advantage of the food and drink specials. Southern Decadence Take in the delightful debachuery that is Southern Decadence, which is billed as “New Orleans' Largest Gay Event.” The multi-day event includes parades with bass brands and a concert on Bourbon St, but the real joy is in checking out the attendees’ outfits (or lack thereof). Southern Decadence French Quarter Take in the delightful debachuery that is Southern Decadence, which is billed as “New Orleans' Largest Gay Event.” The multi-day event includes parades with bass brands and a concert on Bourbon St, but the real joy is in checking out the attendees’ outfits (or lack thereof). April Siese low-key loves the sweltering summer. Give her a follow on Twitter @ayetalian and a sweaty hug if you see her in August.